Until fairly recently, the term “acoustic guitar” was reserved primarily for steel string instruments, with most of the variety within the category coming from different combinations of tonewoods, and different body styles, with dreadnoughts being the most popular by far. In the mid-nineties, however, large-scale manufacturers as well as custom luthiers began to add nylon string instruments to a category that had previously been mostly limited to classical and flamenco guitars. The intent has been to offer nylon string tone and timbre in instruments that more closely resemble instruments that steel string players are used to. This has also meant instruments whose action, neck shape and neck width are more like steel string instruments. But the instant sense of familiarity that comes from such design features can make it easy to ignore just how different these “hybrid” or “crossover” guitars are from either their steel string or their nylon string cousins. That is, until a player actually begins to work with this new breed of guitar. What follows is a heads-up on what to expect, for steel string players considering adding a nylon string instrument to the fleet. Despite previously mentioned ways that hybrid nylon string guitars are similar to steel string instruments, the most obvious difference — and the one that has to be negotiated first — is size and shape. Most hybrid bodies are based on classical guitar dimensions, which means the body size and shape are much more like a grand concert or 00. If you’re accustomed to the large, wedge-shaped body of a dreadnought, pretty much every angle the hybrid presents to you will feel awkward, despite the neck being a comfortable shape and the action being low. If your usual posture is to sit with both feet on the floor and set the guitar on your right knee (if you play right-handed), the relative narrowness of the body, and the waist, will make the guitar seem too low and too far away. It’s also generally true that the body depth will be much less than with a dreadnought, which adds to the feeling of awkwardness. The classical guitar player’s posture places the instrument across the front of the body, about chest-high; and there are lots of strategies to achieve this, from footstools/footrests to various guitar supports that elevate the instrument instead of the player’s leg. Very few non-classical players use such devices, though. Many hybrids come with strap buttons, which can be a mixed blessing. A strap makes it possible to play standing instead of seated, and it can even be used while seated to raise the guitar and eliminate the awkward angles. The tradeoff is that like almost all classical and flamenco guitars, most hybrids have necks that join the body at the 12th fret. A strap button placed at the neck heel makes playing in the upper positions a bit complicated, even with a cutaway. There are a few builders who join the neck at the 14th fret, but they are by far the exception (with price points to match). Some players prefer a 12-fret neck, so this won’t be a drawback to them. Even so, because the fret spacing is much wider on a nylon string guitar than on a steel string — even if the scale length is roughly the same — the differences in overall proportions can seem exaggerated: for example, a five-fret spread (what some call an “extended” position) requires much more reach on a nylon string guitar. One of the biggest marketing points for hybrids is neck shape, which typically includes a radiused fingerboard. This would seem to be a gigantic plus, especially for those who play solid body electrics. But this is yet another mixed blessing: Even though hybrid necks are usually narrower than classical or flamenco necks, they’re still much wider than most steel string necks. It is said that a radiused fingerboard makes barre chords easier to play, but an extra-wide neck (by steel string standards) plus nylon strings, which are much thicker than steel strings even though their tension is much lower, means a lot of work to make a strong, accurate barre. A player with especially large hands could probably work through having to essentially make a wide, radiused barre. A great advantage of a radiused fingerboard on steel string instruments is that it makes string bending much easier. But string bending takes a much more specialized technique on nylon (more about that later), and a radiused fingerboard isn’t much help. The best reason to have a radiused fingerboard on a hybrid is that it makes it a lot easier to fret with the thumb, which is a must-have for many styles, particularly jazz. Hybrid guitar necks often have adjustable truss rods, another design feature borrowed from steel string lutherie. Truss rods, adjustable or not, are extremely rare in classical and flamenco guitars, even ones costing tens of thousands of dollars. Just as we’re living in what some refer to as the Golden Age of guitar building and design, we’re also in one when it comes to strings. There’s a mindboggling range of string choices now, from high-tech materials to high-tech manufacturing strategies, which means that there’s a string set for every style of music or type of guitar, even if you have to make your own custom sets. Tension for steel strings for acoustic and electric guitars correspond to their thickness, or “gauge.” For acoustics the range is typically from “light” to “medium-light” to “medium,” with some specialty gauges such as “bluegrass” falling to either side of medium-light and medium. In pretty much every instance, the thinner the string, the lower the tension (that is, easier to fret). Nylon strings are graded by tension instead of thickness. Some manufacturers prefer to name their grades “soft”-to-“hard” tension; others prefer “low”-to- “high” tension. Either way, there are five essential tension grades: super low (or soft), low, normal (or medium), high (or hard), and super-high (or extra-hard). Normal/medium tension is the most common. Within the most commonly used “nylon” classical string group, the relationship between thickness and tension is the same as it is with steel string. However many classical strings are what is known as the “carbon” type of string, which are usually thinner and generally higher tension than comparable nylon strings. And within that “carbon” type of string, the same principle applies: thicker strings are higher tension. All guitar builders have a make of string that they prefer. Some choose a particular string because it has certain characteristics that bring out particular qualities in the instruments they build. Others outfit their instruments with strings they consider to have a transparency that lets the instrument and the player speak for themselves. One of the most exciting things about having a new guitar, though, is finding out just what brand/tension/material allows your own voice to come through. But it’s also true that every instrument has design limits that affect which tension grades are suitable. Some guitars, for example, can’t handle the stress of extra-hard tension strings. The load on the top is so great that it’s inhibited from vibrating, which results in a less volume and thinner tone — the exact opposite of what you’re trying to achieve, not to mention the added stress on the bridge and the neck. It’s always a good idea to find out the tension grade the builder recommends, and to ask if the guitar can accommodate a higher tension. It’s also worthwhile to compare the actual force ratings of the different strings you’re comparing. Some resellers (SBM, for example, which sets the standard for comprehensive ratings) give the force in pounds (lb) for each string in a set. It’s sometimes a surprise to learn that one manufacturer’s hard tension set carries more force than another’s extra-hard tension set. In addition to tension grades, there’s the choice of materials from what might be called traditional nylon to exotic polymers for the plain strings, to wound strings with corrosion resistant coatings or core filaments made of a space-age material like Kevlar. The bass strings wear out much faster than the trebles, unlike steel strings where it’s just the opposite. And if you buy your strings from SBM you can not only get singles (which a good number of other retailers offer) but you can buy separate bass sets or treble sets for nearly every brand and model of string made. Your favorite set might ultimately be basses from one set (or manufacturer) and trebles from another. 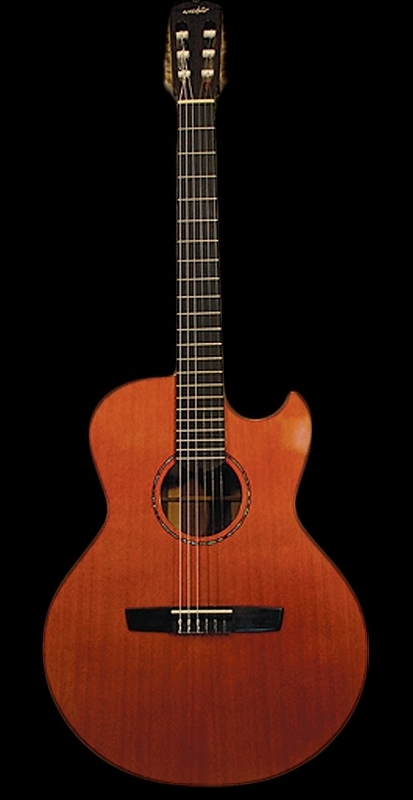 Considering just the strings, the biggest issues in moving from steel to nylon are (a) new nylon strings usually take a lot longer to stabilize; (b) only a few of the many alternative tunings steel string players use are stable on nylon strings — drop-D and DADGAD, and not much else; and (c) very aggressive strumming tends to over-vibrate nylon strings, which knocks them out of tune, and also affects tone — an aggressive sound doesn’t necessarily mean pushing the strings beyond their limit, unless the goal is the raspiness that flamenco players are so famous for. Similarly, pitch bending is an example of less being more. One half-step is about the limit of effective pitch alteration with nylon strings, as opposed to one-and-a-half steps or more for acoustic steel. But the effectiveness of a bend doesn’t always depend on its depth. A one-step slide into a half-step bend can be just as powerful as a deep swooping bend. And musically, it’s the same as a one-and-a half step bend — if it’s timed correctly. So even a style based on bending (the blues, for example) can work very well. There will be more on this in a future post, but a few points deserve to be made here. A radiused fingerboard means that the strings will follow the same curve at both ends. This might seem obvious, but it’s the sort of thing you have to always keep in mind as you’re getting used to not only fretting on a wide arc but also picking on a wide arc. As for picks, they of course also come in gauges; and some players like flexible — light or medium gauge — picks. But an inflexible pick is a much better on nylon strings. A pick that deforms when it contacts the string can’t really activate that string well. That sacrifices tone, volume and precision. As any classical or flamenco player can tell you, hard nails are a huge advantage in every technique used to strike the strings; and those with the disadvantage of naturally soft nails have all sorts of strategies to reinforce them, from commercial nail-hardeners to super glue to materials attached to nails with super glue. Pick-style players have the advantage of not having to submit to constant nail maintenance. They also have an advantage in being able to drastically change their tone and timbre — from one piece to the next, or even within the same piece — by simply switching to a pick of a different thickness or of a different material. The net result is tonal and timbral versatility usually associated with electric guitars. These days, all sorts of materials are being used to make guitar picks: tonewoods used in guitar building (ebony, walnut, etc. ), coconut shell, bone, fossilized ivory, proprietary materials engineered to replicate as closely as possible the best qualities of tortoise shell, and beyond. Nylon string sets are highly responsive to the type and thickness of the material used to activate them. Not everything that works on steel strings works well on nylon — stainless steel or granite, for instance. But here again is another opportunity to experiment, and discover how a certain type of pick can liberate your voice. So, whether you’re looking to add new colors and textures to your sound, or you’d like to make a permanent switch-over to nylon, there’s a world of possibilities to explore. From modified classical and flamenco designs, to various models meant especially for jazz (including gypsy jazz and archtop nylons), and even to models with built-in midi interfaces, there’s a nylon string guitar for almost any musical genre. And they all take “classical” guitar strings. Richard Robeson (www.gandivaus.com) has taught guitar musicianship in Durham, NC and elsewhere since 1981. His own favorite instrument by far is a custom 2004 Wechter 9303C “Jazz Nylon,” featured in ten original world music instrumentals on moonlight over the maghrib (Gandiva 2011). I enjoyed the article, excellent job! I really enjoy playing nylon string guitar, even though I’m pretty much a steel string player, so having a radius-ed fingerboard and a setup that’s pretty low is a must for me. I am also a guitar maker, and I often times build my guitars in sets; a steel string acoustic and also a matching nylon string. This allows the player to switch between the two with minimal adjustment and it is really inspiring and fun for me as a guitar builder too! Hi Tom. Just curious about your process of building your guitars in sets, both a steel string acoustic and a matching nylon string. Do you have to experiment with different methods for refinforcing the necks or the guitars’ bracing for the different string tensions? The radius fretboard and narrower neck is certainly an adjustment for hybrid guitars. Much more difficult to finger pick if one is used to a 2″ wide classical. Hybrid guitars are fast though! Nylgut sets for sale here are labeled “superior tension” (as opposed, apparently, to “normal tension”). Can someone enlighten me on what these terms refer to? Is “superior tension” harder? To add something to this article (very helpful!) and thread, another difference seems to be that the nut slots seem to set the action a little higher for nylon than for steel–to leave nylon strings a little more room to vibrate vertically (as they are wont to do)? The caveat about alternate tunings other than DADGAD or drop-D was spot-on, I’d say (altho open G also works o.k., imho). Thanks for your questions and comments, Charles! Yes superior tension is just another way of saying high tension and your point of the higher nut clearance is well taken. The classical guitar in general does need to allow for the larger amplitude of nylon strings motion, so it needs to be higher. In practice the nut is not the significant source of the extra height or clearance for amplitude. It is mostly provided by extra relief in the middle of the neck, where the difference in comparison to a steel string guitar may be as much as 10 thousandths of an inch, and in extra height provided by set up at the bridge. Thank you for this interesting article. I was playing a steel sting guitar but fell in love with the sound of the nylon strings during a travel in spain and played a classic for six weeks. I bought a hybrid, which feels great to play, especially with the narrow 48mm neck. But i am not sure with the tone. It has 22 frets and a scale lenght of 650mm. The factory strings were d’addario exp hard tension. The 3 higher strings sound kinda dull and the basses kinda buzz. I am wondering if i can make a brighter sound by going to medium tension strings or would it affect the intonation? Or is the sound a characteristica of cedar wood? Different strings and different tensions can make all the difference in the world. If you call or email our Customer Service Representative at [email protected], we can help diagnose your issue with your tone and definitely give you some suggestions for your cedar top guitar. We look forward to your call/email!